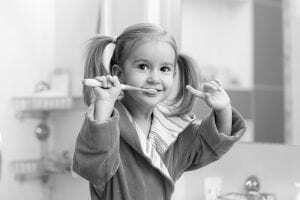 With so many advances in dental technology and so many new prevention tools available, you’d think that cavities in children would be on the wane. But cavities – especially in little kids – are actually on the rise. Here’s a crash course in Cavities 101 to help parents understand what cavities are and how to prevent and treat them. A cavity is a tiny hole in the tooth that forms when acids attack your tooth enamel. To treat cavities, your dentist usually needs to drill away the decay and fill in the area with a metal or composite material to protect the healthy tooth. However, there are some new treatments for cavities in very young children that don’t involve drilling and filling. What some parents may not know is that cavities are caused not by sugar itself but by bacteria that feed on sugar. Sugars – both natural and refined – cause plaque, which in turn creates the acid that causes decay. Sugary foods and beverages are a factor in the development of cavities, but some children are more prone to cavities because of weak enamel. Most parents know which foods are bad for their child’s teeth. And as kids get older, they are usually aware, too. But with so many treats available, sometimes it’s hard to keep best practices in mind – even for moms and dads. And while there’s certainly nothing wrong with a cookie now and then, not all treats and snacks are created equal! The worst culprits for tooth decay are hard and gummy candies, as the sugar in those treats sticks on teeth long after they’ve been consumed. Starchy snacks like chips and crackers are not quite as troublesome, but they do tend to get stuck in teeth, so be sure to brush and floss after eating. Sodas are obviously bad for your teeth, and even diet sodas contain acid that can harm enamel. The sports drinks parents often give young athletes are usually full of sugar too, so watch out for those as well. Even milk and juice can cause problems in young children because of extended use of sippy cups. These ever-present cups put sugars directly in contact with children’s teeth and may be partially responsible for the increase in tooth decay in young children. Your dentist will remind you that water is a miracle drink, quenching thirst better than any sports drink and washing away food particles at the same time. Drinking plenty of water is a perfect solution for better dental health. When Do Kids Start Getting Cavities? According to the Centers for Disease Control (CDC), cavities in young children are on the rise. Even toddlers are coming into dentists offices with cavities. It’s a serious public health concern due in part to parents’ use of convenient sippy cups for extended periods of time. The American Dental Association (ADA) recommends taking your little one to the dentist as soon as first their teeth appear. How Can I Check for Cavities at Home? Tooth pain is probably the number one sign of a cavity in children. If your little one tells you their tooth hurts, it’s best to bring them to see their pediatric dentist. Bad breath or an unusual taste in the mouth can also be warning signs. In some cases, you’ll be able to see a dark or discolored spot, but this usually happens after the decay is pretty far along, so it’s better to pay attention to earlier warning signs. Your child may also feel a small hole in their teeth with their tongue – another sign that a trip to the dentist is in order. And remember, regular dental check-ups are the best ways to catch cavities early! The molars in the back of your mouth can be tough to clean, even with regular brushing and flossing. Dentists often recommend putting dental sealants on the back teeth. This protective plastic coating protects molars (where cavities often form) from decay. According to the ADA, sealants can reduce the risk of cavities in molars by up to 80 percent. Your pediatric dentist can quickly put these sealants on. They act as a protective barrier for your molars, and help keep food and plaque out! What Should I Do if I Think My Child Has a Cavity? If you think your child has a cavity, bring them to their pediatric dentist right away. Your dentist will X-ray the teeth and assess the situation. If your child has one or more cavities, your dentist will help you choose the right treatment based on many factors. The first thing to consider is whether the cavity is on a baby or permanent tooth. Another factor is whether your child has one or multiple cavities, along with the location of the affected tooth. For numerous cavities in baby teeth, one new option is silver diamine fluoride. We encourage parents to check out our article on this promising new treatment for halting cavities in baby teeth! In addition to eating healthy and brushing and flossing regularly, the most critical step you can take in preventing cavities in your children is regular check-ups at your pediatric dentist’s office. Visits every six month – starting when those first teeth appear – will help us keep your child’s teeth healthy and catch potential problems early when they are easiest to treat. 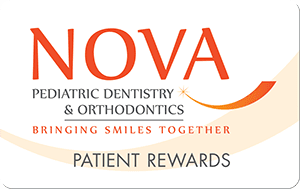 If you have any questions regarding the proper care of your child’s teeth, contact NOVA Pediatric Dentistry & Orthodontics today!